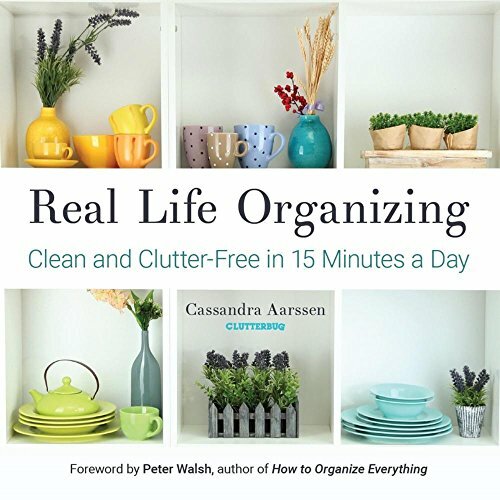 Clutter Stressing You Out? Contain Everything With One Magic Basket. 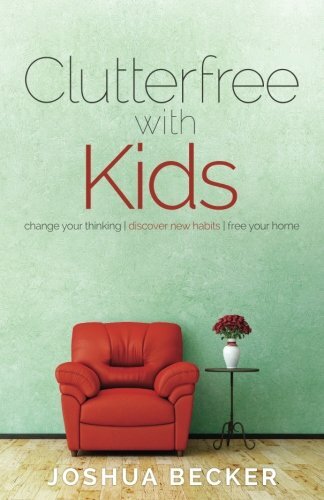 Inside: If clutter makes you angry, and kids leaving all the stuff around the house makes you rage, read how one basket can contain the clutter and teach your family how to pick up after themselves. This post contains affiliate links. It’s almost dinnertime and my boys and I clamber in through the back door. We kick off our shoes, I shoo them downstairs to play so I can make dinner. I turn the corner into our kitchen and I instantly feel overwhelmed. My kitchen is a disaster. Covered with legos , books, phone chargers, school work, and notices about upcoming events that haven’t made it into my calendar yet. How am I supposed to cook when there’s no empty space on my counters? Here’s a pick for proof of how bad it can be. Don’t judge me, m’kay? This seems to happen every day around here, and the busier we are, the worse the clutter gets. I could easily blame my husband and kids, but I totally contribute to this mess, especially when I’m super busy. I drop stuff on the counter then rush off to the next thing. So no…it’s not just my husband and kids who are leaving stuff around. We all contribute to the mess. But, I’m the only one who seems to notice, so it’s usually up to me to gather everything up and clean off the counters. I love an organized home, but I can’t seem to find a good system for my kitchen. Then last month at our MOPS meeting, a professional organizer came to talk with us and share some of her tips. Mid-speech, she pulls out a basket and tells us about this one basket changed her life. My jaw dropped. This was it. This was what I’ve been looking for! I ran home and grabbed a basket and put all the forgotten toys, paper, phone chargers, books, and all the other random things inside. And ta-da! My kitchen was clean. After dinner, I pulled out the basket and explained its purpose to my family. Everything left out will go in this box and after dinner, we’ll divvy it all up and we’ll put away everything. If it’s yours, you put it away. I will no longer be the one in charge of the clutter. I will no longer be the one walking through the entire house putting away all the things. 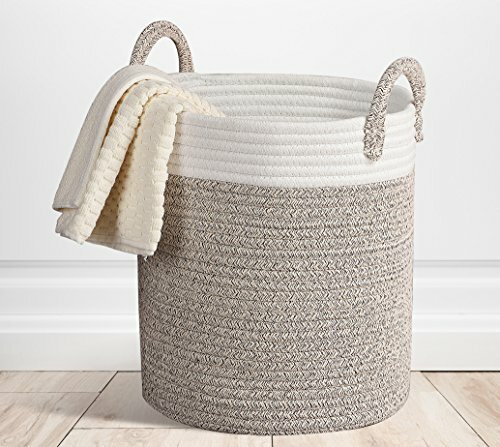 Check out these super cute baskets! The Clutter Basket Keeps Me From Nagging and Yelling. I understand how things get left out because I’m part of the problem too. The problem is that the clutter bothers me the most, so I’m the one either nagging everyone to put away their things, or just doing it myself. I mean, no one wants to stop what they’re doing to pick up, not even me. I understand. That’s why the clutter basket is amazing. It’s emptied at the same time every day, which means there’s time built into our day just for putting away all the random stuff. There is no nagging, yelling, or reminding. It’s just what’s done after dinner. If after dinner doesn’t work for you, find a time in your day when it does work. Build it into your morning routine, or bedtime routine. Pick a time when your whole family is home and can spend a maximum of 15 minutes putting things away. 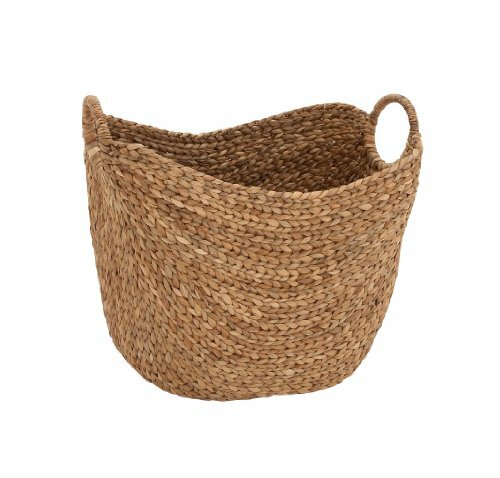 I love the clutter basket mainly because, since the surfaces of our house are cleaner, I no longer end up frustrated by all the mess. I’m no longer feeling resentful and nagging. This Mama’s a lot happier now. It Teaches Teamwork and Responsibility. My family is a team, and this is one chore we get to do together as a team. 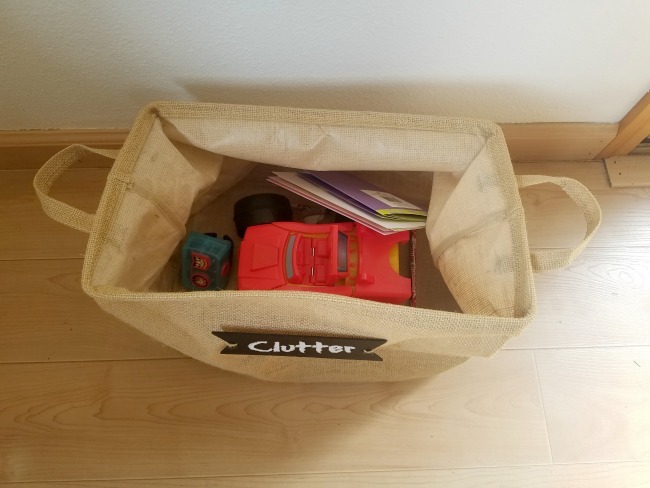 The clutter basket helps each of us take responsibility for our things, and it teaches our children that everyone needs to be responsible for their own things…even Mom and Dad. And, it’s not just me putting things in the basket. My kids enjoy putting things into it too, especially if the object belongs to my husband or me. Apparently, it’s fun to make Mom and Dad pick up after themselves. I’ll also ask kids to put things into the basket throughout the day and will even give them a choice, they can put their toy into the basket to put away later, or go ahead and put it away now. 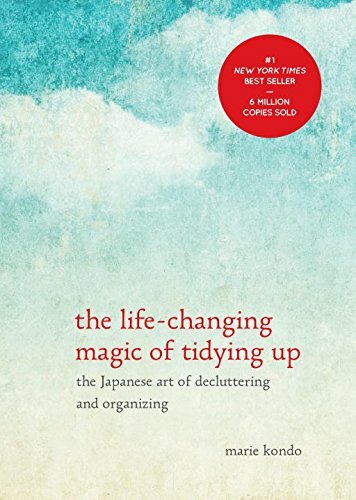 They have the power to chose when they put away their things, but because of the clutter basket, they will still be the one responsible for doing it. It’s been about a month since I’ve started using the clutter basket and it’s been life changing. My house is tidy which makes me less ragy. My family is taking responsibility for their things. And I have more time in my day since I’m not constantly cleaning my kitchen counters. It’s amazing to know that the next time I’m rushing to get home to make dinner, that my clean kitchen counters will be ready for me. No more cleaning before I cook for me! Check out these amazing clutter-free books. Clutter Free With Kids is my favorite! 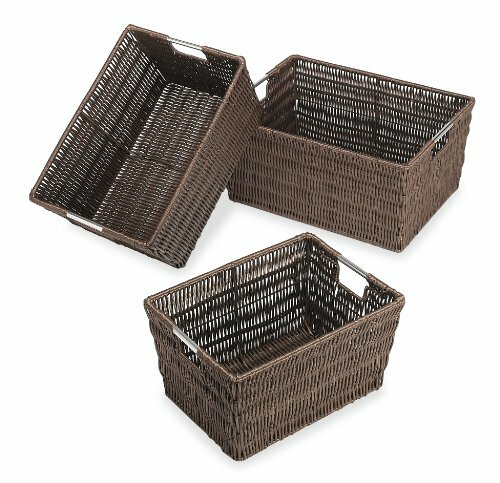 I love your clutter basket idea. THanks for the tip. Also glad to hear you went with the new name of messy motherhood, that is one I voted for. Speaking of clutter maybe you can help me out. My daughter,her husband and my 2 year old granddaughter live with us. Audrey just turned two last month but has developed a huge phobia of dust,dirt and dust bunnies. She cries for ages when she sees them, will not walk on the floor if there is a tiny,tiny bit there. She cries real hard whenever she sees a dustbin niece. We are just not sure how to handle this. Any help or insight into this would be appreciated. this is AWESOME, sometimes its the little things that help so much, thanks! 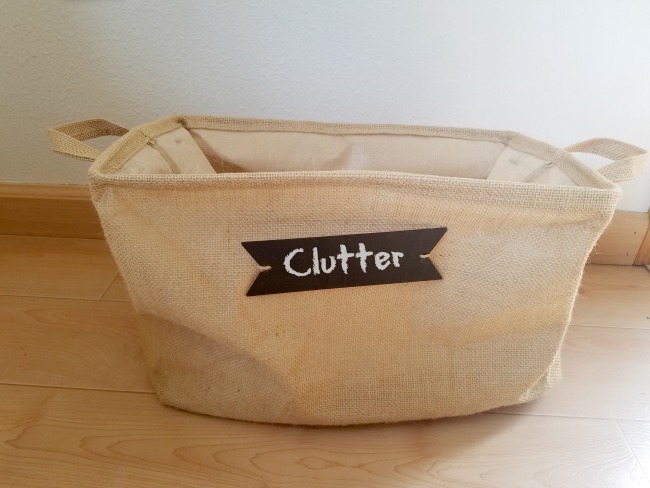 Where do you keep the clutter basket? 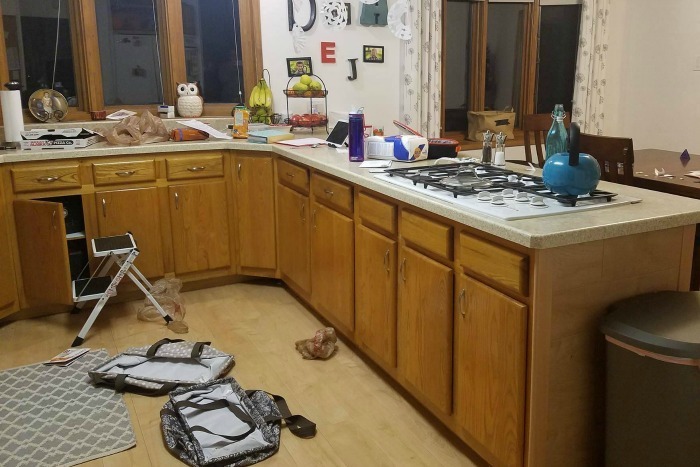 The organizer suggested keeping it in the room with the biggest clutter problem, so I keep mine in my kitchen because that’s where most of the clutter hangs out at my house. We have a pretty big window sill that will hold it, so it lives there, but a friend of mine keeps hers on the floor in the corner. I love this idea Amanda. 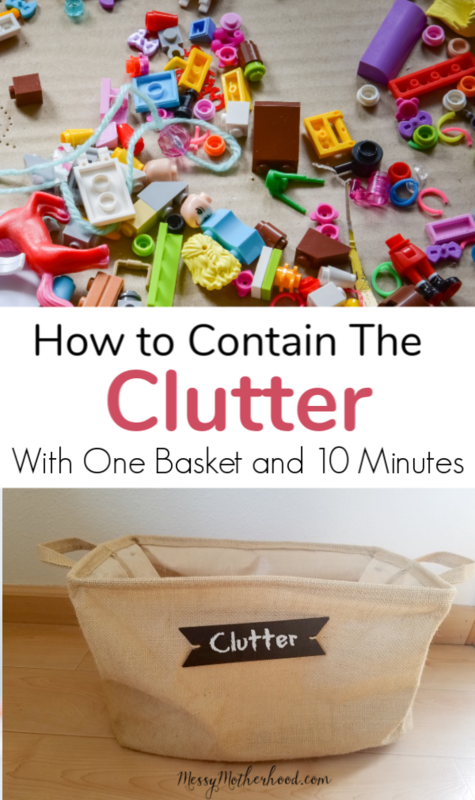 We live in a multi-generation household (my husband and myself, our son and his wife, and their two small children) so the clutter can get way out of hand. This tip may save my sanity? We do a similar thing, only my kids have to do a small chore to “earn back” the stuff that they left out and didn’t put away when they were finished with it. I like this! I may add it to our routine! The clutter definitely drives me crazier than anyone else at our house. And, trust me, most days our counters and the kitchen table are so full you can’t see them. It’s bad. I am getting a basket this weekend and giving this a try. Fingers crossed it works! We do this and it really is a game changer! We have two baskets — one is a rubbermaid tub, large size, that we call the “Rowan Basket” because our daughter Rowan is the messiest in the house. Whenever she can’t find something, she knows to look there. We don’t make her empty it every day, but once a week seems to work. We keep it in the laundry room, which is somewhat central to the house and makes it easy to drop things into the Rowan Basket. The second is a smaller basket for the remaining five members of the family, including the baby. I sort this once a day and direct the other kids to put their things away from this basket. I have friends who have adopted this practice as well, and they love it! So does this work for daily artwork that is started but not completed you out everything on this basket ? Thank you for this!! So simple! I literally get enraged on a nightly basis about the stuff left in our kitchen…why the kitchen? LOL! I can’t wait to try this tonight! I love this idea! Thank you for sharing! I also LOVE the idea of pulling out the basket and giving the responsibility of emptying it to your children and husband–group effort, teamwork as a family!